Tripoli, Libya (CNN) -- Libyans erupted in euphoria Thursday after longtime Libyan dictator Moammar Gadhafi was killed by revolutionary forces who were finally able to overrun his hometown. 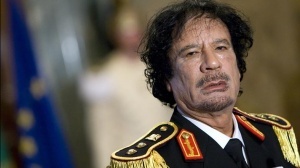 Gadhafi had himself declared "King of Kings" of Africa. But Thursday, he appeared bloody and lifeless in grisly cell phone images broadcast across the world. Libyans took to the streets to celebrate the end of a brutal era, to mark the historic day that the former strongman, once thought of as untouchable, was gone. They sighed relief that after many months of fierce fighting, the war was over. They had won what had been dubbed one of the Arab Spring's most improbable uprisings. Mahmoud Jibril, the chairman of the executive board of the National Transitional Council, declared Gadhafi dead. Also killed Thursday were Gadhafi's son Mutassim and the chief of intelligence, Abdullah al-Senussi, said Anees al Sharif, a spokesman for the National Transitional Council's military arm in Tripoli. A video broadcast on the Al Jazeera Arabic network showed fighters surrounding an injured, blood-smeared Gadhafi and hoisting him onto the back of a truck. Another video showed an apparently dead Gadhafi with what appears to be a wound to his head. A photograph distributed by the news agency Agence France-Presse also appeared to show Gadhafi covered in blood. Revolutionary fighters attacked the house in Sirte where Gadhafi was hiding, Information Minister Mahmoud Shammam told CNN. Gadhafi was shot while trying to flee. "Col. Gadhafi is history," Shammam said. Gadhafi's body was taken to Misrata, said Mahmoud Al Nacoua, the Libyan ambassador to Britain. The confirmation of Gadhafi's death by Libya's new leadership came after hours of conflicting reports as to the deposed leader's status. When those reports first reached U.S. Secretary of State Hillary Clinton, she reacted with one word: "Wow." She said the end of Gadhafi would "add legitimacy and relief to the formation of a new government." Abubaker Saad, who was a Gadhafi aide for nine years, said it didn't really matter whether he was dead or alive -- as long as he was no longer a fugitive. "As long as he was on the run, he represented a very ominous danger to the Libyan people," Saad told CNN. "He represented a very ominous danger ... to the idea of the democracy in Libya." Saad said he never saw Gadhafi sleep in the same place two nights in a row. "This man has been doing it for 42 years. He has experience in hiding," Saad said. "So I am thrilled to see the Libyan fighters in Sirte (were) able to kill him or capture him." NATO said it will convene for a meeting to discuss ending its operation in Libya, a senior NATO official told CNN. "It will be very soon, perhaps next day or two," the official said. Adm. James Stavridis, supreme allied commander of NATO, is looking at "key pieces of intelligence" to make that recommendation. That will include assessing whether the revolutionary fighters control Sirte, which NATO believes they do, and whether Gadhafi loyalists can mount any significant counterstrike. Earlier, NATO aircraft struck two pro-Gadhafi military vehicles in the vicinity of Sirte. Libyans, who have been waiting for months for Gadhafi's demise, erupted in deafening celebrations on a historic day. They knew to be quiet under Gadhafi, but they were anything but on Thursday. Even before confirmation of his death, a cacophony of celebration could be heard in Tripoli as ships and cars blared their horns and shots were fired into the air. It's a great moment," said Shammam, the information minister. "I've been waiting for this moment for decades, and I'm thanking God that I'm alive to see this moment." Gadhafi ruled Libya with an iron fist for 42 years after seizing power in a bloodless coup against King Idris in 1969, when he was just an army captain. By the end of his rule, he claimed to be "King of Kings" of Africa, a title he had bestowed upon him in 2008. But a February uprising evolved into civil war that resulted in ousting the strongman from power. Gadhafi, wanted by the International Criminal Court in The Hague, Netherlands, for alleged crimes against humanity, had not been seen in public in months. "I think today is a day to remember all of Col. Gadhafi's victims," said British Prime Minister David Cameron. "People in Libya today have an even greater chance of building themselves a strong and democratic future." World leaders sounded encouragement for a new Libya but cautioned that the road ahead will hardly be easy. "In the coming days, we will witness scenes of celebration, as well as grief for those who lost so much," said United Nations Secretary-General Ban Ki-moon. "Yet let us recognize, immediately, that this is only the end of the beginning. The road ahead for Libya and its people will be difficult and full of challenges."